Asymmetry is one of the most unusual and fascinating errors of human reproduction. A subtle asymmetric variation of the contralateral structures of the face occurs commonly in the general population, even in the absence of any local lesion or condition. Some of these changes, however, may slowly but steadily progress to exhibit asymmetrical development. Hemihypertrophy, congenital hemihypertrophy (CHH), hemimacrosomia, or partial gigantism are the terms used when the association of these changes with time or modifying circumstances, such as trauma, is absent. The first description of this phenomenon was by Meckel in 1822 and was first reported by Wagner in 1839. Hemihypertrophy or hemihyperplasia is rarely reported and is often described in the literature as hemihypertrophy rather than hemihyperplasia. It may involve an entire side or an isolated part on one side of the body. Mandibular angle ostectomy has been popular since Baek et al. introduced it in 1989. Ostectomy with an oscillating saw through an intraoral approach has been the standard procedure for correcting prominent mandibular angles. The last two decades saw the rise of various modifications of these techniques., Although the procedure provides relatively satisfactory results, the major drawbacks comprised limited access and difficulty in controlling the blind ostectomy. With the modifications in the ostectomy to the body, angle, and symphysis, and with modifications in the armamentarium, near-normal esthetic correction can be achieved by recontouring the gonial angle (GA) and the mandibular plane angle in relation to the Frankfort horizontal plane. 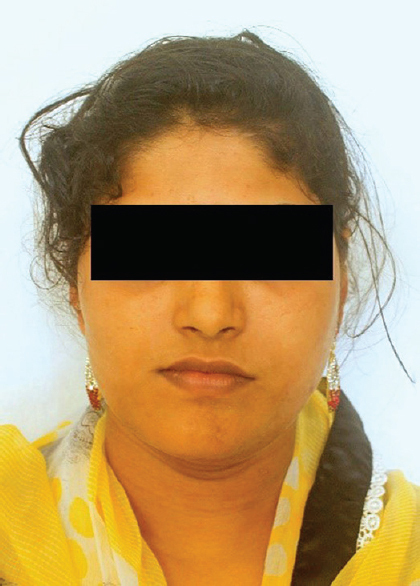 We report the successful surgical management of a 20-year-old female patient who presented with the chief complaint of asymmetry near the lower third of face for 5 years [Figure 1]. She had no history of trauma to the face. The patient had enlarged left lower facial half limited to the midline. 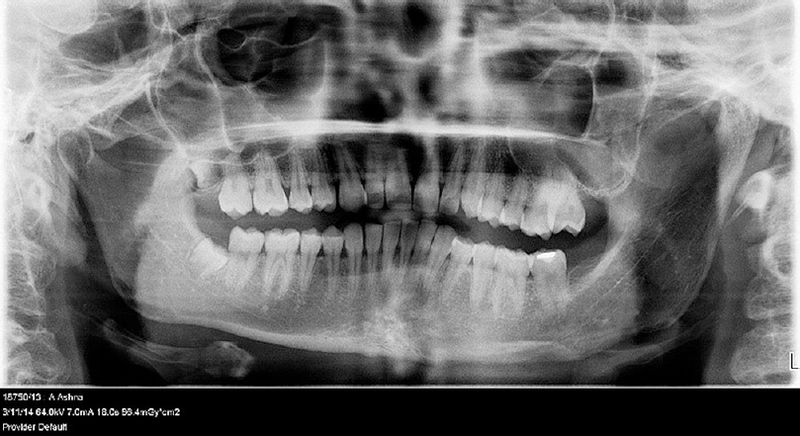 The intraoral molar relation was Angles class I with midline shift to the right. After a thorough examination, we concluded on a working diagnosis of hemifacial hypertrophy. The patient underwent general anesthesia through nasotracheal intubation. A 0.25% lidocaine solution with 1:200,000 epinephrine was used for initial transcutaneous infiltration into the masseter muscle and in the angle ramus region, followed by an intraoral administration along with the incision line extending from the anterior border of the ascending ramus of the mandible to the midline. Subperiosteal tunneling was done from the anterior, posterior, and inferior border of the mandible, taking the necessary precautions to avoid damage to the retromandibular vein and the mental nerve. The masseter and the medial pterygoid muscles were detached from the angle using a periosteal elevator. Thus, the inferior posterior part of the ramus, GA, and the body was exposed to the midline. The planned ostectomy was duplicated on the patient according to the radiographic measurements with the help of calipers. The ostectomy outline was marked with contra-angle handpiece using a round bur. The corpus angle ostectomy followed the curvilinear line which connected the two lines (one along the posterior border and the other along the anterior border of ramus) [Figure 3] at the posterior and inferior border of the mandible. The bur holes made with contra-angle handpiece were placed on the posterior part of the line and continued anteriorly till the symphysis region. Bur holes were placed with 2–3-mm intervals along the curvilinear line using a long shaft bur, drilling both the outer and inner cortex, which was later connected. Ramus-angle ostectomy was done using a contra-angle handpiece and completed with a curved chisel to overcome the difficulty in access. This maneuver had overcome the limited access through the intraoral approach which was almost impossible without complications. Using the curved chisel to complete the ostectomy, it was possible to control the direction of the medial blind ostectomy and also to safeguard the vital structures. After taking care to guard the medial anatomical structures, body and anterior lower border ostectomy were done with the sagittal saw. 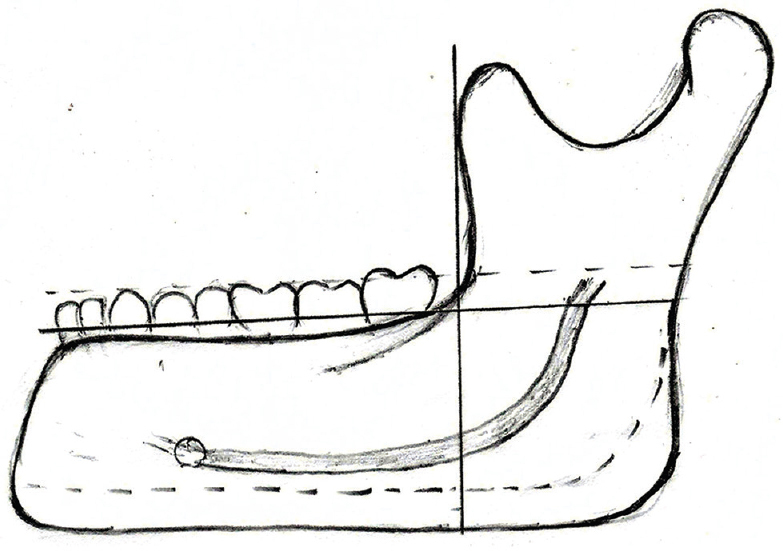 After separation of the ostectomized segments [Figure 4], a round bur was used to smoothen the inferior corpus border, angle, and posterior border of the ramus of the mandible postostectomy. A minimum of 10 mm was kept from the mandibular canal bearing in mind the ultimate goal of near normal symmetry in comparison to the contralateral side. Thus, to correct the asymmetry, we performed an extended en bloc mandibular corpus-angle ostectomy (EMCAO). Incisions were irrigated with dilute betadine and saline solutions. The extraoral drain was placed for 24 h. The intraoral incision was closed with 3-0 vicryl sutures. The compressive dressing was maintained for 3 days. Postoperative analgesic and the antibiotic regimen were continued for 7 days. Periodic patient recall showed excellent clinical and radiographical healing and results [Figure 5]. Hemifacial hypertrophy is a rare developmental anomaly exhibiting asymmetric growth of one or more body regions. The condition may either be isolated or associated with a variety of multidimensional and variable faceted syndromes. Demographically, men and Whites are more commonly affected, and the right is more affected than the left. The condition accentuates with age, especially around puberty. Most evident signs of CHH manifest in the orofacial region and can constitute a diagnostic problem. The conditions that mimic CHH exhibit sufficient clinical differences with the former and should be distinguished based on specific radiographic, clinical, and histopathological findings. The prime objective of treatment is the establishment of a new mandibular angle with near-normal values and corresponding to the contralateral side. Treatment contemplation begins when the physiological growth ceases, and cosmetic considerations take priority. CHH is associated with a good prognosis and stabilizes at the end of adolescence. Other surgical procedures such as orthognathic surgeries, soft-tissue debulking, and cosmetic reconstruction such as facelift involve extensive maneuvers and multiple procedures. In cases with significant occlusal cant and mid-face asymmetry, one should treat them with single or multistage osteotomies before proceeding with EMCAO. Prominent mandibular angle is not a unique problem of mandibular angle but a complex problem of harmony of the midfacial bone, masseter muscle, and whole mandibular contour. We generally evaluate the patient's middle and lower facial contour as a whole preoperatively. Ostectomy of the mandibular angle adapts to purely square lower face. To the patients with wider midfacial width caused by protrusion of the zygomatic complex, reduction malarplasty is needed. The other variations of EMCAO include full-thickness marginal ostectomy of the mandibular corpus angle followed by corticectomy, intraoral curved osteotomy of the angle by continuous drilling, and chiseling, V-line ostectomy combined with outer cortex ostectomy, and endoscopic-guided procedures. Single-stage facial asymmetry correction with resultant desirable esthetic achievement by EMCAO with the modifications in armamentarium is possible and is a feasible alternative to multiple, extensive procedures. Deshingkar SA, Barpande SR, Bhavthankar JD. Congenital hemifacial hyperplasia. Contemp Clin Dent 2011;2:261-4. Gorlin RJ, Meskin LH. Congenital hemihypertrophy. Review of the literature and report of a case with special emphasis on oral manifestations. J Pediatr 1962;61:870-9. Islam MN, Bhattacharyya I, Ojha J, Bober K, Cohen DM, Green JG, et al. Comparison between true and partial hemifacial hypertrophy. Oral Surg Oral Med Oral Pathol Oral Radiol Endod 2007;104:501-9. Hirohi T, Yoshimura K. Lower face reduction with full-thickness marginal ostectomy of mandibular corpus-angle followed by corticectomy. J Plast Reconstr Aesthet Surg 2010;63:1251-9. Kim SK, Han JJ, Kim JT. Classification and treatment of prominent mandibular angle. Aesthetic Plast Surg 2001;25:382-7. Whitaker LA. Aesthetic contouring of the facial support system. Clin Plast Surg 1989;16:815-23. Yang DB, Park CG. Mandibular contouring surgery for purely aesthetic reasons. Aesthetic Plast Surg 1991;15:53-60. Purushothaman B, Raveendran R, Sundareswaran S, Harindranathan M, others. Soft tissue cephalometric norms of Malabar population in Northern Kerala: An epidemiologic study. J Indian Orthod Soc 2012;46:65. Khanna JN, Andrade NN. Hemifacial hypertrophy. Report of two cases. Int J Oral Maxillofac Surg 1989;18:294-7. Hall HD. An improved method for treatment of facial asymmetry secondary to jaw deformity. J Oral Maxillofac Surg 1984;42:673-9. Gui L, Yu D, Zhang Z, Changsheng LV, Tang X, Zheng Z, et al. Intraoral one-stage curved osteotomy for the prominent mandibular angle: A clinical study of 407 cases. Aesthetic Plast Surg 2005;29:552-7. Baek SM, Baek RM, Shin MS. Refinement in aesthetic contouring of the prominent mandibular angle. Aesthetic Plast Surg 1994;18:283-9. Han K, Kim J. Reduction mandibuloplasty: Ostectomy of the lateral cortex around the mandibular angle. J Craniofac Surg 2001;12:314-25. Deguchi M, Iio Y, Kobayashi K, Shirakabe T. Angle-splitting ostectomy for reducing the width of the lower face. Plast Reconstr Surg 1997;99:1831-9. Hwang K, Lee DK, Lee WJ, Chung IH, Lee SI. A split ostectomy of mandibular body and angle reduction. J Craniofac Surg 2004;15:341-6. Jin H, Park SH, Kim BH. 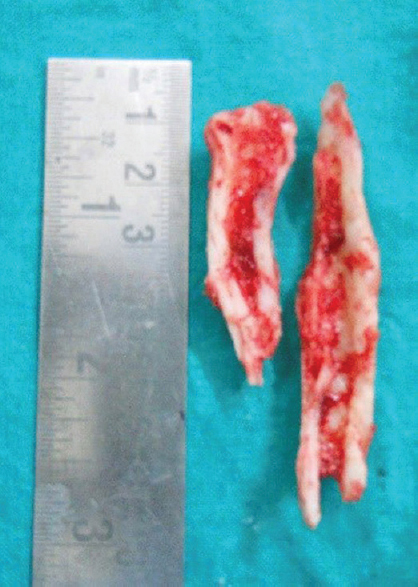 Sagittal split ramus osteotomy with mandible reduction. Plast Reconstr Surg 2007;119:662-9. Yoon ES, Seo YS, Kang DH, Koo SH, Park SH. Analysis of incidences and types of complications in mandibular angle ostectomy in Koreans. Ann Plast Surg 2006;57:541-4.